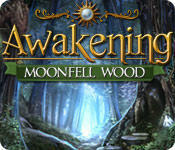 Awakening: Moonfell Wood is a hidden object puzzle game and the sequel to Awakening: The Dreamless Castle. Having escaped the magical kingdom she's been imprisoned in, Princess Sophia continues to find her people and bring peace to the land by journeying through a mysterious and incredible forest. The forest holds many puzzles that require solving as well as many allies which Sophia will need if she is to plot a path this maze like area. The game continues the same tradition of gameplay the first did requiring sections where hidden items need collecting, objects or mechanisms require manipulation with a collected item in order to progress. Mini-games also need completing involving matching tiles (a variation on mahjongg), memory games, uses for objects in the inventory and other challenges. The game also introduces a pocket sized dragon that can be used to light dark areas in the game or provide a way through an obstacle. As usual hints are provided, this time by a friendly owl while important information read is automatically added to your journal.